This article contains affiliate links. By purchasing items through my links, I receive a small portion of the sale at no extra cost to you. This helps support me and keep my blog running smoothly! 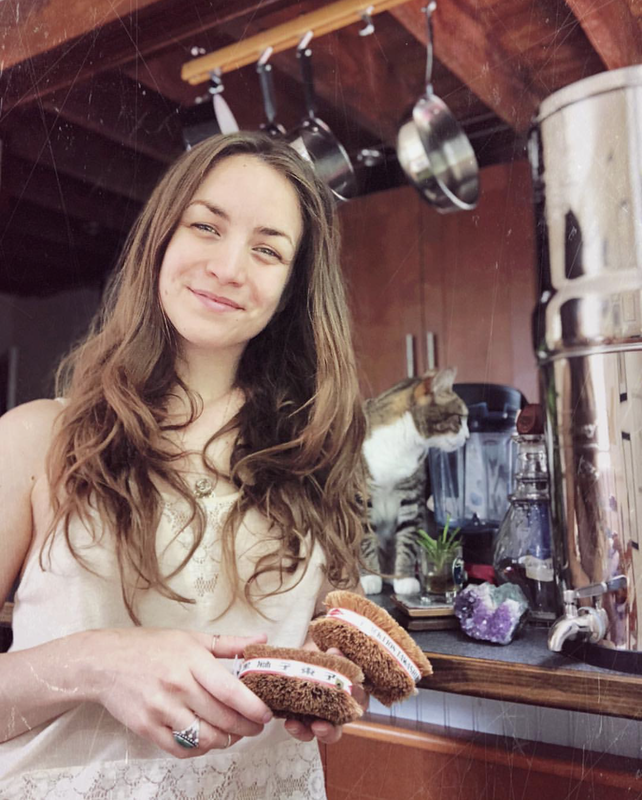 You may recognize these from my blog post, The Best Eco-Friendly Kitchen Products. And honestly? These things are that awesome – they absolutely deserve their own post! 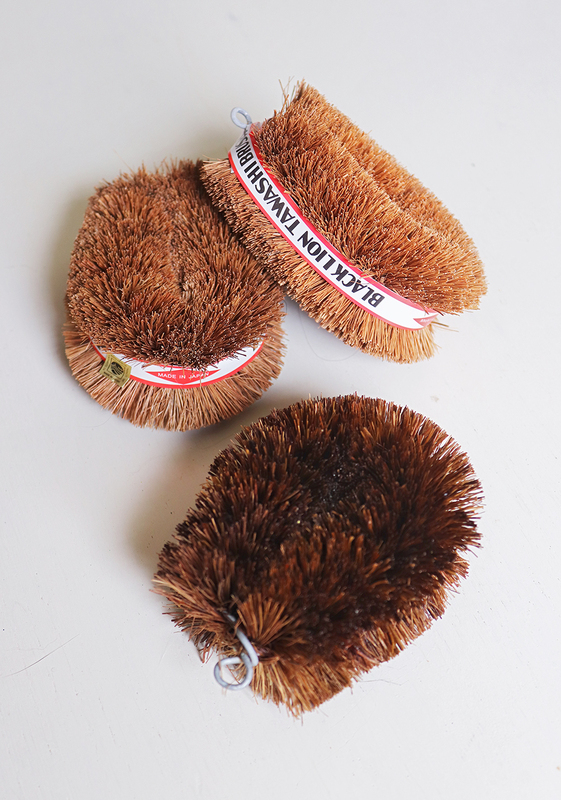 After searching extensively online, I learned about these traditional Japanese scouring brushes. Just a plant based bristle on a metal base. No plastic. Lots of scrubbing power. And guaranteed to last. I was sold – and I bought three. What is a Japanese Tawashi? A Japanese Tawashi is made of tightly bound hemp palm fibers or coconut palm fibers – held together by a thick metal wire core. 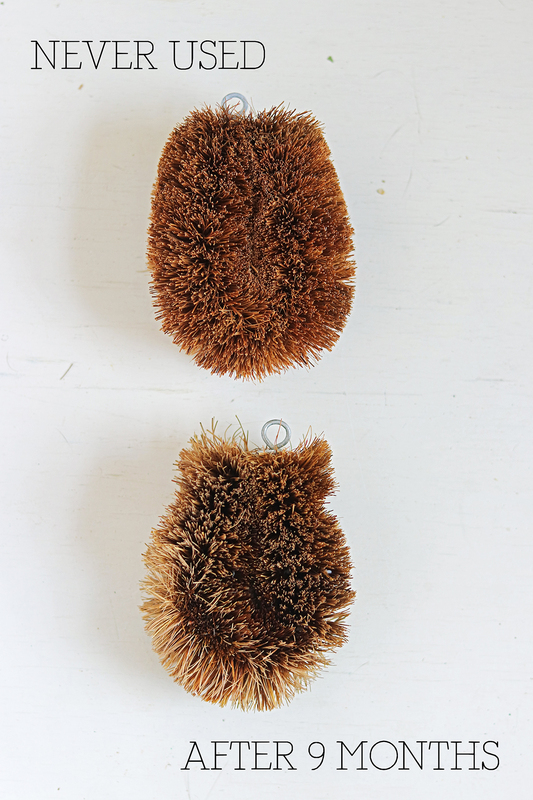 They are the definition of a multi purpose scouring brush, and have been used in Japanese homes for over 100 years. Its roughly the size of your palm, waterproof, and is made with a small hook on one end for hanging dry. The bristles are completely biodegradable (yay!) making it a great eco-friendly kitchen product and kitchen sponge alternative. Pretty much ANY Cleaning job that requires scrubbing! The fact that I have not bought a sponge in 10 months can attest to the fact that these are absolutely amazing and a must have for cleaning! Of the three Tawashi’s I purchased, I have one that I keep in the bathroom for cleaning, one I have by my sink for dishes, and one under the sink I haven’t used yet. In the kitchen I use these as dish scrubbers. They tackle heavy grease, cooked on food (like Colin’s eggs), and pretty much anything else I throw at them with ease. The bristles are stiff, which makes it easy for them to scrape up any stuck on or dried food. I love them much more than any other scrubbing sponge I’ve had! Prior to having the Tawashi in my home, I had a really difficult time getting our porcelain tub & porous tile walls clean in our shower. I had a plastic nylon bristle brush which was just NOT cutting it. And I wasn’t about to use any harsh chemicals. Ultimately, I ended up using a vinegar spray on the tile (and scrubbing with the Tawashi), and dish soap on our tub – and scrubbing with the Tawashi. The Tawashi was able to cut through all the soap scum and built up film in the tub easily! And it was comfortable in my hand – which made it much easier to get the grout between tile, and all over the tub. As you can see (particularly in the first image, and in the bottom left corner of the bottom image), the bottom bristles where I apply more pressure to wash a dish with my forefinger have gotten bent out of shape, and I’ve probably lost a few. However, the rest of the Tawashi has held up beautifully with minimal change over 9 months. Overall, the only reason I would switch to a new one, is simply because of less scrubbing power at the bottom where the bristles have splayed out. This is why I plan to continue to use it on more flat surfaces like counters, sinks, floors, ranges, etc. for general cleaning. I get asked this question a LOT. Truthfully, because of the nature of the brush, I don’t think it holds on to AS many germs as your typical kitchen sponge – I don’t find it getting particularly smelly. 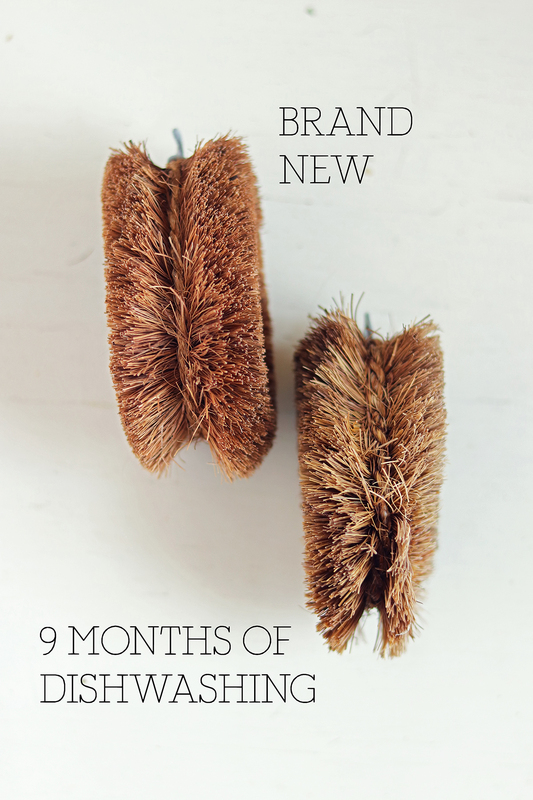 However – with using it over so many months you definitely want to find ways to sanitize it. After every use, I make sure to rinse very well under hot water to get all of the soap out. If you’re cleaning something very sticky (like cooked on eggs), you have to also be sure to get any food remnants out of the bristles (the main downside of this – but you have that happen with most any sponge). Then, I hang to dry using the metal loop, instead of letting it sit in a dish. Following this procedure, I don’t experience any bad smells. Every couple of weeks, I either run it through the dishwasher, or I boil it to sanitize it. Boiling it is my go-to because its fast, and I think its better at getting any small food particles that might be stuck in the bristles, out. Just bring a small pot of water to a rolling boil with the Tawashi inside. Boil for at least 2 minutes to sterilize it. If it smells bad, you can splash a little vinegar or baking soda in the water too. I would say the largest downside to these scrub brushes is that the bristles can collect things easily. In the bathroom, its often hair – which pulls out easily. When I’m doing dishes, I often find small bits of food stuck in the bristles (its worse if its something sticky like eggs, or rice) that can be frustrating to get out. I have even ‘combed’ the brush with a fork before trying to get all of the food out. Overall though, it isn’t THAT difficult to get out, and when its particularly stubborn and a strong stream of water doesn’t work, boiling almost always gets the food out. Additionally, you’ll notice they don’t hold on to soap as easily as the synthetic sponges you are used to. You may find that you have to put a small pump of soap on after just doing one pot or two. Sometimes when I am scrubbing a baking sheet with my Silpat which holds a lot of oil, I have to soap up twice. All things considered, I still don’t find that I am going through an alarming rate of dish soap. 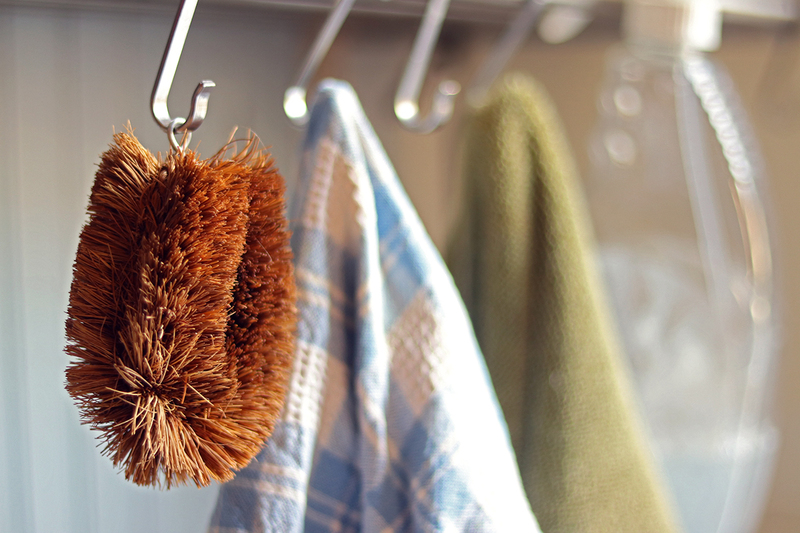 Your single best kitchen sponge alternative is switching to a low-cost plant-based Tawashi – which will last at least 12x as long as your average disposable kitchen sponge. Not only is it more environmentally friendly, it is also far more economical! I recommend purchasing online – as I’ve never seen these sold in stores. 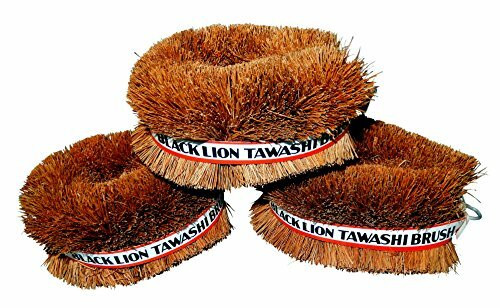 These are the Tawashi’s I purchased. Did you enjoy this review? Get one for yourself? Show us on Instagram #homewithwillow, or join our Facebook group! Thank you for this! Getting SO FED UP with normal sponges!